A one-star review or customer complaints can feel like a stab to the heart for your business. This is especially true if you have a limited number of reviews and it is on a site that gives you no option to remove a negative review, no matter how false they are. 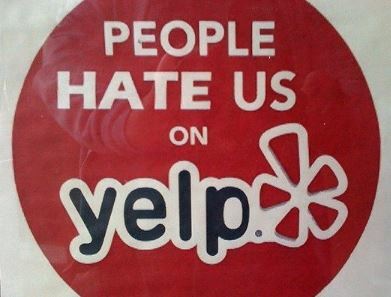 Receiving a negative review on a site like Yelp or Local.com means that people who utilize your services or products are active on that site. So you need to be active as well and not ignore the issue. That bad review will be there as long as the site is there. Know that in most instances you are not helpless. We would all prefer five-star, glowing reviews, but negative reviews give you a chance to learn about the most important side of the customer experience and show your compassionate, customer-centered professionalism in how you handle a dissatisfied customer. DON’T argue with or insult the reviewer. You probably won’t change their minds but maybe the next customer’s. If you have a true belief in your business, your product, and your service you can show this to future customers and reviewers by suggesting in your response that the unhappy reviewer return to your business and see what a pleasure a typical customer experience is and how much you care about your customers and your business. Ask them to update their review with their new experience. A review reversal is priceless advertising for your business and displays how much you care. Almost all local review sites give the owner a space to publicly respond to reviews. Google Places, Yahoo Local, Trip Advisor, Yelp, Insider Pages, Merchant Circle, and SuperPages all allow responses and most of these will allow owners to edit and delete reviews (except for Yelp which seems to stay in litigation about this very issue) so reach out to customer service on these sites and see what exactly they can do to help you with a negative review. In PART 2 we address COMPOSING your response to negative reviews online. In PART 3 we address POSTING your response. In PART 4 we address how to COMBAT negative reviews. How have you responded to a negative review? Let us know in the comments. ← Previous Post Infographics and Data Visualization – What Can You Draw?